We are the pioneer of Automatic PVC collarband Cutting Machinery, Also we are the first company who makes machinery and die set for collarband cutting in PET material. Our machine is the best in industry and its worth investing. We are one of the prominent manufacturers and exporters of precisely designed Plastic Collar Band Cutting Machine. Massively used for cutting PVC, PET and PP, the proffered range is capable of cutting single and double sheets as well. Manufactured in accordance with the set industry standards, these efficient machines are equipped with digital control panel for feed length settings. This Machine is for Plastic Collar Band Cutting. This Machine can cut PVC, PET,PP. Machine equipped with Fully Automatic Feeder for Material Feeding. Machine runs at the rate of 90-100 Pc's Per Minute. Machine can cut Single or Double Sheet. New Twin Cam four Piller design For better Life of Die Set. Inline Number Punching for slots. Inline Logo Punching for branding. Inline scrap cutters in Die. Digital Control Panel for Feed Length Settings. High Quality Steel for Die. Harden and Grinded Punch and Die Plates. 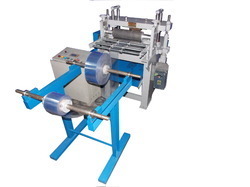 We are one of the prominent manufacturers and exporters of Plastic Butterfly and Collarbond Cutting Machine.Used for cutting Polyester,PVC, PET and PP, the proffered range is capable of cutting single and double sheets as well. Manufactured in accordance with the set industry standards, these efficient machines are equipped with digital control panel for feed length settings. This Machine is for Plastic Collarbond and Butterfly Cutting. This Machine can cut Polyester, PVC, PET,PP. Machine runs at the rate of 50-80 Pc's Per Minute. New Twin Cam Piller design For better Life of Die Set. Looking for Plastic Collar Cutting Machine ?